Pyroprotect is a class B-s1,d0 fire retardant coating for exterior use where fire and flame protection is essential but where there is a requirement for a high quality aesthetic appearance that will withstand the ravages of wind, rain and the effects of UV from the daylight. Pyroprotect is first and foremost a fire retardant coating that penetrates deep into the timber causing a chemical reaction that renders the substrate flame retardant reducing the spread of fire . Pyroprotect can be applied without the need for heat treatment or pressure treatment. This spray or brush applied coating can be applied at ambient temperatures with no specialist equipment. Making it ideal for the treatment of in situ timbers such as railway sleepers, underground timber structures. Pyroprotect is also a protective wood stain that helps to prevent mould, rot, mildew, fungi forming on the surface of the timber. Giving you lasting protection for up to 5-10 years subject to the conditions. 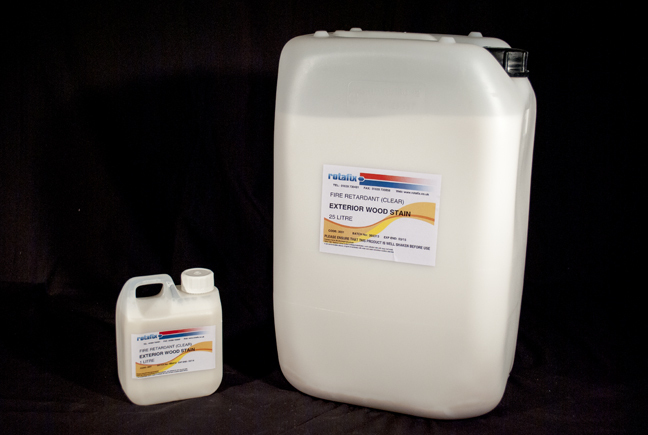 Suitable for processing new and wood preservative-treated wooden surfaces. It is not suitable for surfaces treated with film-forming coatings (lacquers, paints, oils), as the pyroprotect changes the chemical structure of the substrate. Pyroprotect can be used to protect accelayted timber such as Accoya or heat treated timber.